D DOLITY 5x Creative Animal Ornament Water Floating Duck Lying Frog on Lotus Leaf Figurine Resin Green Plants Kid Toys Fountain Decoration Garden Decor | Fountain City Art Ctr. We sell 100% brand new and high quality products. You can get what you want here at a competitive price! Don't hesitate, just buy it! - Water floating lotus leaf frog ornament and cute yellow ducks, extremely realistic and highly detailed garden decoration, summer landscape. - Animal statues lawn ornaments, great indoor or outdoor decor, plant decoration. 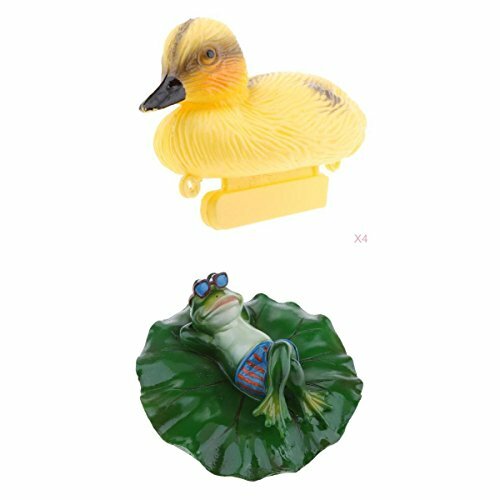 - Cute animal statue, perfect for garden pond, swimming pool, fishpond, fountain, bathtub, and other water floating decoration. - Duck with a counter weight at the base to keep it upright, also a deadly decoy for hunting or fishing. - Perfect summer home decor craft gift, desktop ornament, garden ornament, patio decoration, photo prop, kid toys, etc. Cute animal statue, perfect for garden pond, swimming pool, fishpond, fountain, bathtub, and other water floating decoration. Perfect summer home decor craft gift, desktop ornament, garden ornament, patio decoration, photo prop, kid toys, etc. Water floating lotus leaf frog ornament and cute yellow ducks, extremely realistic and highly detailed garden decoration, summer landscape. Animal statues lawn ornaments, great indoor or outdoor decor, plant decoration. Duck with a counter weight at the base to keep it upright, also a deadly decoy for hunting or fishing. If you have any questions about this product by D DOLITY, contact us by completing and submitting the form below. If you are looking for a specif part number, please include it with your message. Essential Garden Angel Fairy Fountain 17.72" x 16.54" x 20.47"